Cowboys Limited Edition - My first of Many...? - Ford F150 Forums - Ford F-Series Truck Community. Growing up there was always a Chevy parked in the Driveway. From a 1960 Brookwood and a 1962 Nova all the way up to a 1992 Suburban and 2010 HD3500 Duramax Diesel. The bow-tie was kind of a symbol or culture figure for my family. Recently I stumbled upon a true gem...sitting all alone in a field outside of town, covered in dirt and dust with a shabby homemade For Sale sign. Out of plain curiosity, and the fact that I was in the market for a used truck, I made a U-turn on the highway that sent my wife into a cursing fit. There was not a house in sight and no real means of communication save for the lonely Cell number scribbled on the window. Sure, the truck had seen better days but there was something there that had a hold of me, that kept me intrigued. Dialing the Cell number I managed to raise the owner who at first cursed me for the late calling but was extremely pleased at the thought of a buyer for his old truck. Just inside 15 minutes the owner was pulling up the old shell road with a cloud of dust settling in behind him. The old man had seen plenty of days come and go. He spoke with a southern accent so thick I had a hard time trying to follow him as he rambled about his Son who had recently passed away and left the truck sitting in the field to rot. I tried to go around through the normal talks about mileage, "wear and tear" and a few other issues when he handed me the keys and said, "Son, just drive her around a bit. I don't know a damn thing about it." I opened up the driver's door to find a slightly dulled grey interior that was in relatively good condition, save for a few coffee?coke stains in front of the console. I reached in and put the key in the ignition and held my breath while I turned the key, hoping not to hear the dreaded squeal or knocking from an abused engine compartment. The truck turned over once and came to life. The engine was quiet and exhaust purred like kitten. I crawled in and settled into the driver seat, shut the door and placed the old truck in Drive. I spent a few moments warming the engine before I finally released the brake and gave her some gas. Starting to make a timid growl, she tore down the old shell road with the agility and ease of a Demo Model. I am now the proud owner of my first Ford. 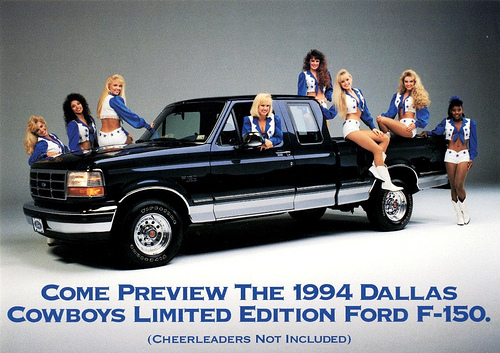 My little find turns out to be a 1994 F-150 XLT "Cowboy Limited Edition", a commemorative edition Ford produced in honor of the 93 Dallas Cowboys who dominated the Buffalo Bills 30-13 in Superbowl XXVIII on Jan. 30th, 1994. Still with original interior label of #022-900, I can guarantee that this Ford ill not be my last. Consider me a true fan, I am now looking to trade in my Chevy's and seeing what the local Ford Dealership has to offer. Hi Steve! Welcome to the forum and that's a nice Ford to have for your first one! Quick Reply: Cowboys Limited Edition - My first of Many...?